The Vikings committed 11 penalties during Sunday’s 26-9 loss in Pittsburgh. The team couldn’t get off the field on defense and struggled to find an offensive identity. Daniel House provides his initial thoughts on the road loss. Updated: September 17, 2017, 4:45 p.m. 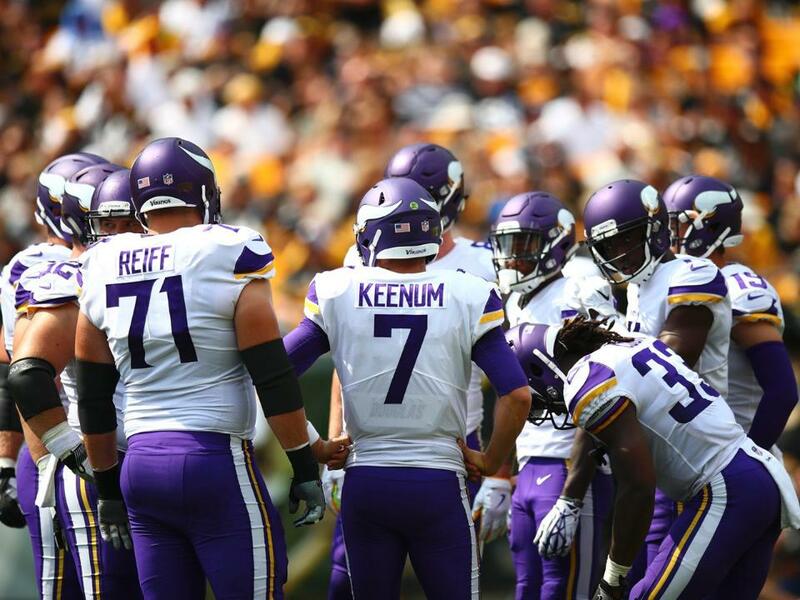 The Vikings were incredibly undisciplined during Sunday’s game in Pittsburgh. The team committed 11 penalties for 131 yards, allowing the Steelers to extend drives. Minnesota had a penalty on all but two of the Pittsburgh scoring drives, including a key offsides penalty in the first half. The Steelers gained five first downs from penalties, which kept the Vikings’ defense on the field for an extended time frame. The Steelers controlled the clock and picked up large chunks of yardage off penalties. This was a very undisciplined effort by the Vikings and many of the issues in this game were self-inflicted. As a whole, the defense kept running back Le’Veon Bell and wide receiver Antonio Brown in check. Bell rushed for 87 yards on 22 carries and Brown tallied just 62 receiving yards. The key difference in this game was the Vikings’ inability to execute their individual responsibilities. Minnesota only notched 237 yards and added another 131 in penalty yardage. That type of effort will almost always lead to poor results. Minnesota was without quarterback Sam Bradford, who was missed Sunday's game with a knee injury. Case Keenum ran the offense and the unit was plagued by pressure up front. Riley Reiff and Mike Remmers combined to lose multiple reps on the edge. Nick Easton whiffed on several blocks and had a key holding call that haulted a drive. Remmers and Easton clearly struggled the most among the offensive lineman. Keenum was under duress significantly, but had opportunities to move up in the pocket, too. More importantly, he could have potentially made better adjustments at the line of scrimmage to counter the pressure Pittsburgh was sending. Keenum looks less comfortable when the pocket is condensed, which is something he faced on a consistent basis Sunday. However, the offensive line really struggled and it put a strain on the entire unit. Running back Dalvin Cook created yards after contact and nearly had his first career NFL touchdown. Cook’s vision, combined with his second gear on the edge makes him tough for opposing defenders to bring down. He was one of the lone bright spots on offense, adding 64 yards on 12 carries. The defense was highlighted by penalties during almost every drive they were on the field. Whether it was offsides, holding, or pass interference, their mistakes allowed the Steelers to stay on the field and bleed clock. The Vikings were unable to play complementary football in all three phases. An unsuccessful fake punt, missed extra point, and a poor kickoff return were just a few additional errors made on special teams. Those mistakes, combined with the problems on both sides of the ball were not a recipe for success. The secondary particularly struggled by picking up holding and pass interference calls. Minnesota was lined up incorrectly during a 27-yard touchdown reception by Martavis Bryant on cornerback Terence Newman. In addition, cornerback Trae Waynes was beaten deep and picked up a pass interference penalty. Newman, Waynes, and Rhodes all tallied holding or pass interference infractions. The Vikings clearly had issues in the secondary, which was a concern entering the season. Minnesota’s front-seven was one of they key reasons the Vikings remained within striking distance. Everson Griffen used an inside spin move to sack quarterback Ben Roethlisberger. He notched a pair of quarterback takedowns and two tackles for loss. The Vikings were able to apply pressure, but penalties completed derailed much of the success. It was clear the Vikings missed quarterback Sam Bradford, but penalties and poor offensive line play were the name of the game. Cleaning both of these issues up will be critical as the Vikings prepare for a sneaky home matchup with the Tampa Bay Buccaneers next Sunday. Waynes, Remmers and Easton were terrible. 131 yards in penalties is ridiculous. I think the leadership is in question - two years ago this team won with good defence, special teams and a modest offence. And we played disciplined football. They didn't make a lot of mistakes and took very few penalties. I realize this is one game - it was a loss on my calendar. What worries me isn't the loss but the way they lost. Next week will tell us a lot. If we play disciplined football and just get beat so be it. If we play like today it's going to raise a lot of questions.